Elegant round forms and harmonious lines characterise the new Belluna Blueray. 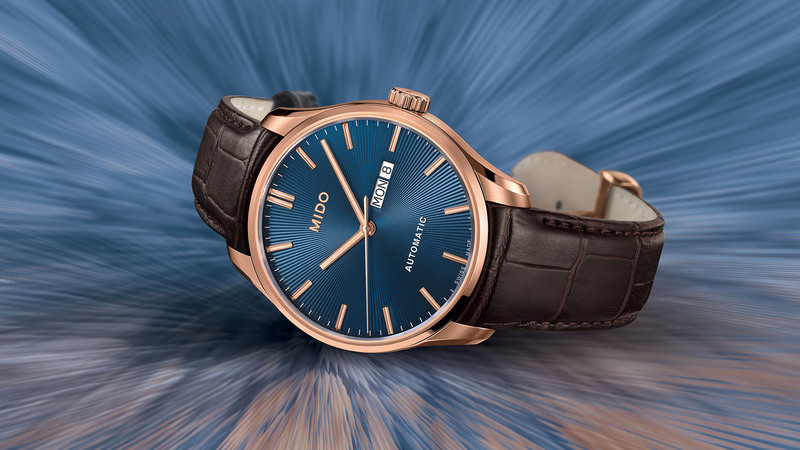 Its satin-finished and polished stainless steel case with rose PVD treatment gives it remarkable shine and presents a superb contrast with the deep blue dial. Finely worked with a sunray guilloché-style pattern, it was inspired by the splendid glass dome roof of London’s Royal Albert Hall.The refined curves of the Belluna Blueray also pay homage to this monument, which is one of the most famous in the United Kingdom. This model is equipped with a latest-generation automatic movement: the Caliber 80, which gives it up to 80 hours of power reserve. Subtle and dazzling, the Belluna Blueray is perfectly suited to all those who love timeless, classic watches. Inaugurated in 1871 to promote the arts and science, London’s Royal Albert Hall is now one of the most renowned concert halls in the United Kingdom. Built in a style true to the Victorian era, this huge red brick monument consists of a series of concentric circles. Its curvaceous, rounded architecture is impressively dominated by a central glass dome. Mido was inspired by this magnificent building to create the Belluna range, which displays perfectly harmonious forms and embodies timeless, classic elegance. 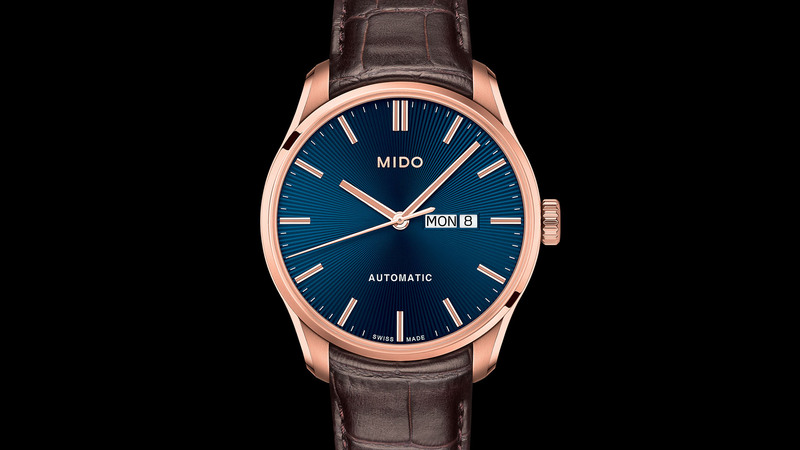 The new Belluna Blueray is a perfect expression of Mido’s watchmaking expertise. 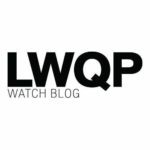 Its harmonious lines and rounded design make it a resolutely timeless watch. It features a satin-finished and polished stainless steel case with rose PVD treatment, which gives it a remarkable shine. Measuring 42.5 mm in diameter, this elegant round case presents a magnificent contrast with the deep blue dial. Finely worked with a sunray guilloché-style pattern, it was inspired by the splendid glass dome roof of London’s Royal Albert Hall. A faceted, domed sapphire crystal with an anti-reflective treatment on both sides protects this sumptuous dial and allows the wearer to freely admire its fine design, hands and applied polished and sandblasted indexes. The day and date can be read through an aperture at 3 o’clock. Despite its classic style, the Belluna Blueray houses a latest-generation automatic movement: the Caliber 80, which gives it up to 80 hours of power reserve. 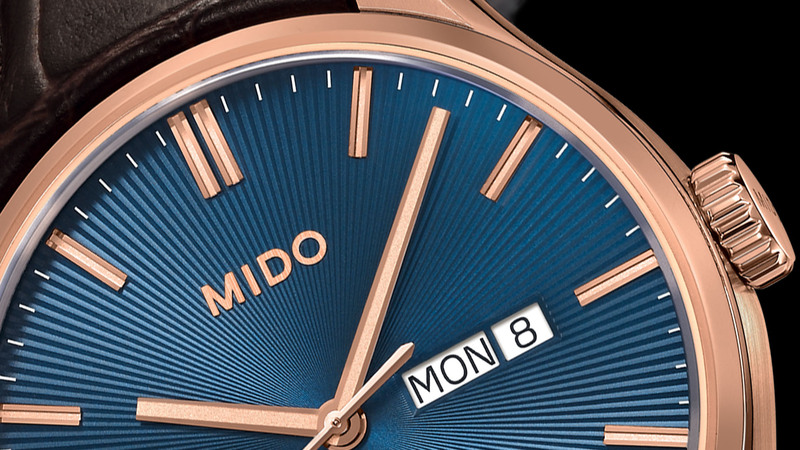 Thanks to the transparent case back, enthusiasts of fine watchmaking mechanics can admire the finely decorated Elaboré-grade movement, which features an oscillating weight adorned with Geneva stripes and the Mido logo. Water-resistant up to a pressure of 5 bars (50 m / 165 ft), this model is equipped with a brown crocodile-look calfskin strap. It is integrated into the case for superior comfort and features a folding clasp in stainless steel with rose PVD treatment. The new Belluna Blueray is priced in Thailand at 31,600 THB.